Robert “Bob” Manly Huff makes his home in Portland, Oregon where he and his wife, Juliana Knight Mills of designpony, moved in the fall of 1995. 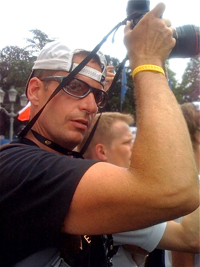 Huff is passionate about the things he loves; friends and family, art and photography, bikes and bike racing. He’s a flexible creative thinker who enjoys working with a team to make great photos. Huff was born in Kentucky and grew up in the Cleveland, Ohio area. After high school, he attended the University of Wisconsin-Superior and Kent State University where he earned a Bachelor of Science in Photo-Illustration. Bob’s first job out of school was in the photo studio of a Cleveland department store where he worked his way up through the department. He then moved to Chicago and assisted area photographers, shot for his own clients, created art for regional art exhibitions and met his now wife, Julie. Bob and Julie are avid travelers, venturing to national and international destinations with Portland as their home base. When not on his bike, Huff shoots for a variety of clients and is active in the local art scene.